Sellers tipped into the market early today however the weakness was short lived as news trickled across the Bloomberg that a tentative deal had been struck on border security (aka the Wall) that would avert a second government shutdown. 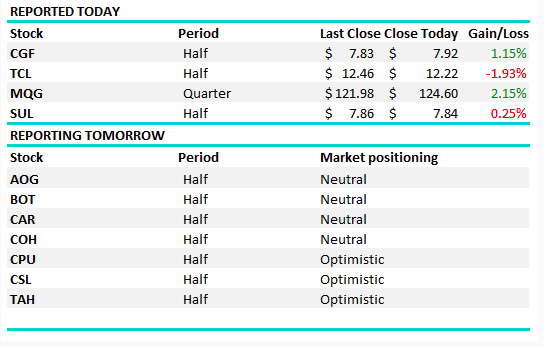 That saw US futures rally +0.50% and our market put on a quick +30 points before lunch ahead of a fairly quiet afternoon session. Consumer confidence data was weak before open today however the 11.30pm print on housing was more important, and it was soft with home loans printing -6.1% MoM versus a decline of 2% expected.Weakness in credit persists and that saw some sellers come back into the banking stocks – Bendigo (ASX:BEN) hit another -2.6%, BOQ down -2.74% while CBA fell by 0.66% before trading ex-dividend tomorrow. 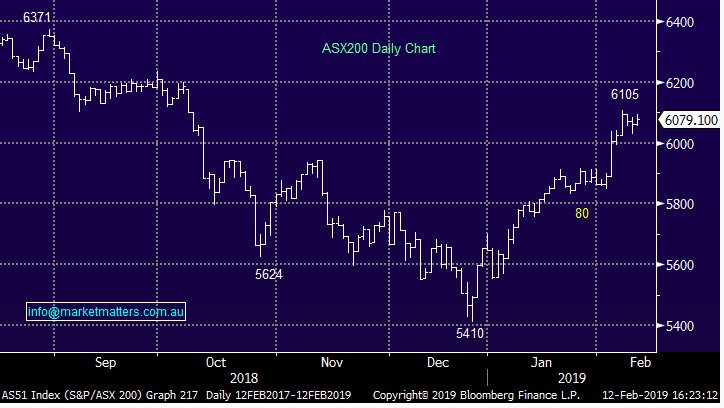 It was actually a pretty soft session locally considering the positive move in US Futures, during our time zone + we saw a strong move in Japan that was trading up around +2.5% at our close – perhaps the ~3% outperformance in Oz from last week is starting to look extreme! 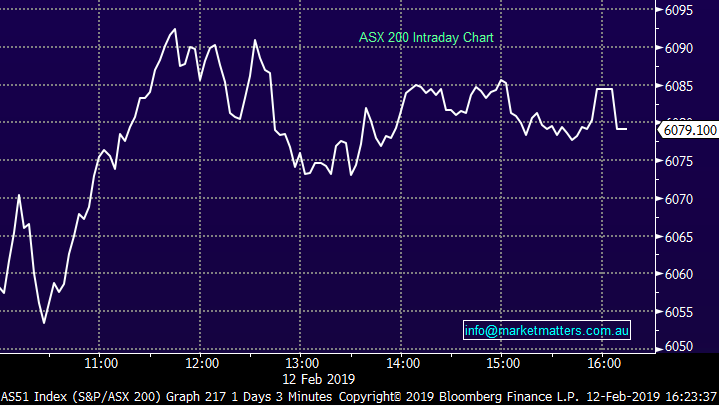 Reporting; Another volatile day for companies reporting and a busy one on the desk - Harry only had a chance to run the numbers on Macquarie (below) while I provided a quick take on Challenger & Transurban. 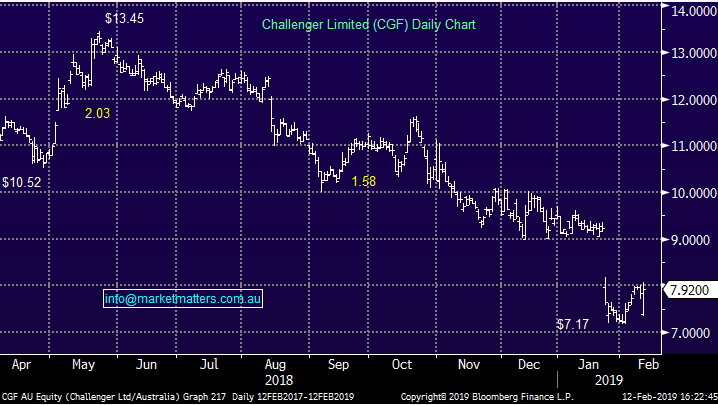 Challenger Group Financial (ASX:CGF) +1.15% which had obviously downgraded at the end of January, so there was no real headline risk in today’s 1H result - however the detail was important, and created some decent volatility in the stock. It was initially sold off hard from $7.83 down to a $7.35 low before it rebounded fairly strong back up to ~$8 before closing at ~$7.92. We sold CGF recently for a loss, a pretty painful one however the reason for the sale still stands post todays numbers. The product cash margin is down by 17 bps from 2.12% in 2H18 to 1.95% in 1H19, which is the continuation of a trend. While the company says its reducing its risk profile on its investment portfolio, at the same time its increasing its capital growth assumption on that portfolio which doesn’t really make sense. In terms of actual growth, life annuity flows have fallen significantly and annuity book growth during 2Q19 was 1% which is the lowest growth rate for some time. We’d question why they maintained the dividend when the business is under some pressure. 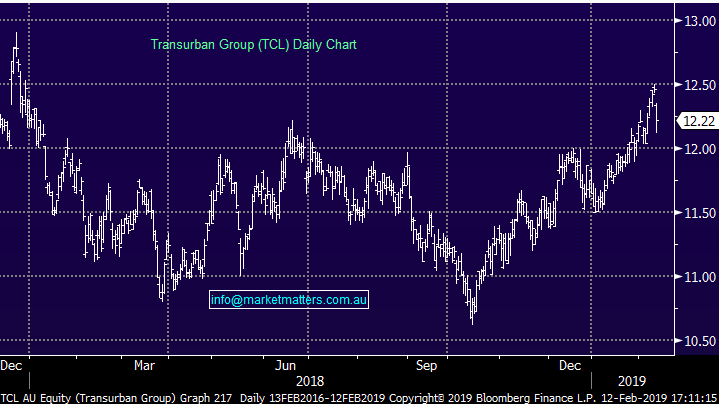 The toll road operator Transurban (ASX:TCL) -1.93% was also out with 1H19 numbers, and at the revenue line they were around 3% light versus expectations and about 4% at the EBITDA line, however they did maintain full year dividend guidance of 59cps which is positive, given it’s often considered a bond dressed up as an equity. There was actually some in the market thinking a cut to the dividend would happen given the big pipeline of work in both WestConnex and NorthConnex, the latter of which has now been delayed from this year to some stage in 2020. The market thought Q1 next year was a possibility however it now seems that’s optimistic. From a stock perspective, the big rally in global bonds which has put pressure on yields has helped TCL rally from October onwards, however at this point in the cycle, we have no interest. 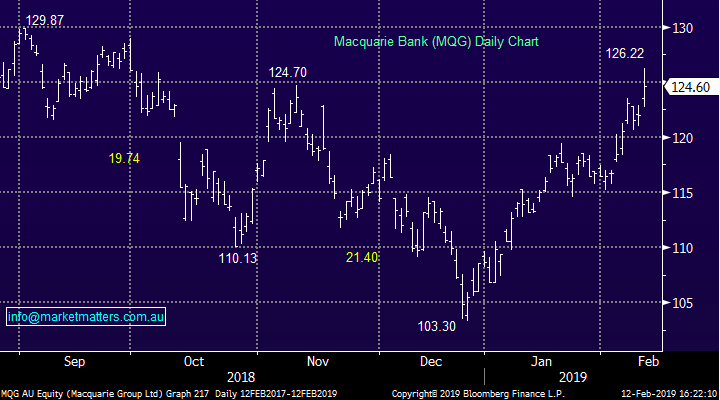 Macquarie (ASX: MQG) +2.15%; The bank rallied on an operational update today showing performance has been strong 3 quarters through the year with Macquarie looking at an ‘up to 15%’ increase in profit for the year which is slightly behind the consensus view of 18% profit growth but inline with their prior guidance. For the quarter, Macquarie has seen the market’s facing business drive performance with Macquarie Capital & Commodities and Global Markets rebound from more muted year in FY18. The asset management business has shrunk in the financial year to date, however some larger transactions in the asset finance and banking divisions have helped to offset the fall. The fall in asset management revenues has been attributed to poor market conditions which saw a 2% fall in assets under management (AUM) in the quarter and a slide in performance fees to be charged. As always, Macquarie’s guidance included the caveat of “future market conditions makes forecasting difficult” – somewhat ironic from an investment bank, but always leaving room to surprise to the upside at the full year result.